Finally, at Sunday morning I just landed at Adisutjipto Airport Yogyakarta. There are so many experiences that I got from Thailand. This is my first time I visit Thailand. First, I saw the organizer is well performing to gave us luxury services and experience about Thailand worth more than USD 5000 (source: price list). Airline tickets from Yogyakarta to Bangkok, Luxury guides, Luxury Lunch and Dinner, Ticket from Bangkok to Phuket, Stayed 2 nights at Fusion Suites Bangkok, 2 nights at Sri Panwa Phuket, 1 night at Sukko Spa Phuket, and 1 night at Conrad Bangkok. I also got free medical treatments and free trip to some tourism objects. Good job, two thumbs up! Second, I met great persons: Mr. Robert Schrader, Mr. Gary Arndt, Ms. Claire Marie Algarme, Mr. David Shaidali Jr, Mr. Chun Keat Ng aka Wilson, Mr. Michael Rose, Mr. Nguyen Tung Lam, Mr. Scott Frankum, Mr. Ivan Henares, Ms. Nellie Huang, and Ms. Victoria Svederberg. That's very-very priceless. And the last, what will I do when get the main prize? After discussed with my friends and my family, we have a little plan donate them for disaster victims, because they need the money to recover their life, and the other reason is because I think I already got the main award prize: great experience and met great persons! This photo taken by me at Thailand as a part of Thailand Medical Tourism Blog Contest. When I said long journey, I'm not in hyperbolic speech. This is true long journey. After selected as one of Thailand Medical Tourism Blog Contest finalists, I got airline ticket to flying from Yogyakarta on Sunday, 21th Nov 2010 using Garuda Indonesia connecting with Singapore Airlines. FYI, flying from Yogyakarta to Jakarta take about 55 minutes. 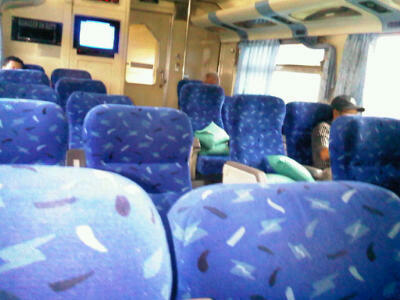 Using car need about 12 hours, and using executive train need about 8-10 hours. Adisutjipto Airport authority already operated the aiport again today (20th Nov 2010 12.00 GMT+7) after closed for more than 2 weeks after Merapi volcano eruption. Then, Garuda contact me and said that the flight is cancelled. So I went to Garuda office to get re-schedule, but this is weekend, and all seats fully booked. Despite of gambling with airport and weather condition, I decided to get a train ticket. Once again, queue in the ticketing office at Tugu Train Station Yogyakarta is very long because many people change their transportation from airplane to other alternatives (car, bus, and train). Thanks to PT Kereta Api, because we can book and buy ticket online, so I bought one. Now, I'm on the way to Jakarta, and I hope everything is okay so I can arrive to Bangkok on time. For more information about my trip to Bangkok you can visit http://medblogcontest.com/blog/5/. Adisutjipto airport Yogyakarta still closed for 2 weeks because Merapi Volcano eruption haven't go to stable condition. Volcano ash still pollute the sky, so it very dangerous for flight. In the history, volcano ash of Mount Galunggung (1982) in Java ever made engines failure of a Boeing 747 immediately after enter the ash cloud. Fortunately, 3 of 4 engine successfully started again and landed safely at Jakarta. The transportation authority of Indonesia close Adisutjipto Airport of Yogyakarta (IATA: JOG) until 20 November 2010. Alternatively, people in Yogyakarta who want to fly to another cities can depart from Adisumarmo Airport Solo (IATA: SOC) or by train from Tugu Rail Station (I call it in slang language "Bandarel Tugusutjipto"). I hope Merapi Volcano back soon to the good condition so the airport will be opened because I have trip plan from Yogyakarta to Thailand on 21 Nov 2010. But the most important is I hope Yogyakarta recovered, so the refugees and life victims can back to the home to build their life again. Remember my last post in Indonesian language about free travel to Thailand from Thailand Medical Blog Contest? The Tourism Authority of Thailand via their event organizer invite me to be one of 12 finalists to visit Thailand and attend the contest. The Medical Blog Contest, organized by the Tourism Authority of Thailand, is aimed at promoting medical tourism within the Kingdom. The competition is open to each individual blogger who has acceptable experience in writing tourism, medical or medical tourism related blogs in English language and/or bloggers' local language. 12 qualified bloggers, also known as Finalists, will be selected to experience for themselves pre-selected key medical and health service providers (e.g. Hospital, clinic, spa) from five randomly selected destinations (Bangkok, Phuket, Pattaya, Chiang Mai and Ko Samui) over the course of 4 consecutive days, and then 3 more in Bangkok. The TAT and/or Organizer will also arrange a variety of sightseeing tours for Finalists, so further encouraging Thailand’s attractiveness as a medical tourism hub. I hope everything going great, and I can learn and post more about Thailand tourism promotion by experiencing the medical tourism journey, so everyone can learn about how Thailand transform their health service into medical tourism service for foreigner. For information about the finalists is located at the website of medical blog contest. The organizer gave me blog to post at http://medblogcontest.com/blog/5/. We moved our production office from Yogyakarta to Bandung due to Merapi Volcano eruption. Bandung is about 380 km from Yogyakarta and can be reached by airplane, train, or car/bus. Flight from Yogyakarta to Bandung is available using Wings Air with ATR-500 everyday. But today the flight is unavailable because Adisutjipto airport is closed. So I decided to go to Bandung by train from Tugu Station using Argo Wilis departing at 12.17 GMT+7 with estimated tim arrival 19.40 GMT+7. And I still on the railway when I write this post.